An aging dancer takes on the most important new role of her life. A young woman tumbles into love with a great painter. A teen strives to define herself and make her voice heard. 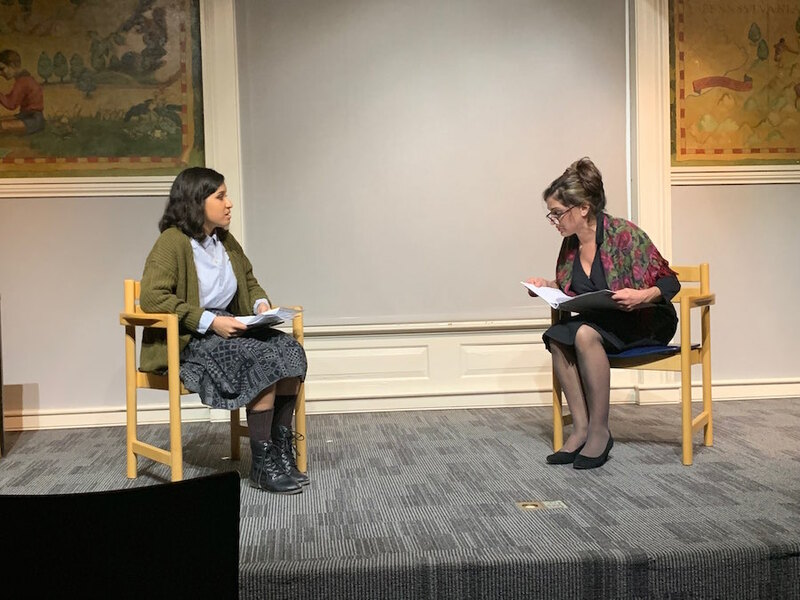 Last Saturday, NOPlays Theatre presented those stories as part of HERstory, a performance combining four short plays about strong women in history. An audience of just over a dozen gathered in the program room at Ives Library to watch Little Swan a Pas de Deux and A Moment of Silence by Allie Costa, Frida Kahlo: Heartbreaker by Lylanne Musselman and After the Thin Man by Shellen Lubin. 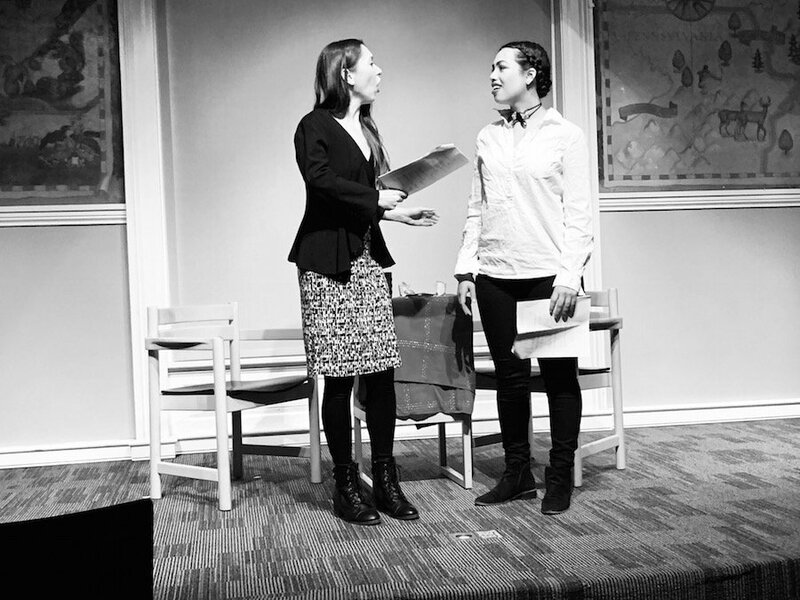 The performance marked NOPlay’s fifth anniversary of producing plays written for 365 Women a Year: A Playwriting Project. Though the numbers have been getting better in recent years, NOPlays’ founder Natalie Osborne said she was shocked when she learned as a college student how few new plays produced each year are written by women. That first year she wrote Making Frankenstein about Mary Shelley and produced it at the student center along with three other plays by women, about women. The following spring, the Milford native was invited to produce a similar show at Silk Road Art Gallery in New Haven, and HERstory was officially born. As an emerging playwright, Osborne has produced much of her own material and said she enjoys watching her plays come to life on stage, especially when she can collaborate with other female writers. “Sometimes you’re submitting and submitting and hoping that people are reading it and liking what they see, but there’s definitely that empowering element when you can do it yourself and get it out there,” she said. Osborne is also an actor; last Saturday she played a young tourist who meets and falls in love with Frida Kahlo, bubbling with the bright energy of young love. The happy tourist started the show smiling easily, her excited words falling all over each other as she awaits Kahlo in a cafe. Her emotions turned to impulsive jealousy as she discovered that Kahlo also had an affair with the woman serving them, and then blossomed into anger as she realized how devoted Kahlo remained to her husband Diego Rivera. Alexandra de Hart played Kahlo equally aloof and alluring. She flirted at one moment and made hurtful remarks the next. “That wasn’t nice. I can’t always be nice. I have great pain,” she said, her tear-filled eyes staring far into the distance, revealing Kahlo’s inner turmoil with a brave vulnerability. In the world of this play, Kahlo’s “eyes, her hands may wander, but she only has room for Diego in her heart,” which she is unapologetic about following. Little Swan featured an older dancer who visits a rising young star, Anna Pavlova, minutes before she appears on-stage in “The Dying Swan,” the role that made Pavlova famous. Moira Malone played the older dancer with a wistful and slightly reticent demeanor, asking the ambitious younger woman her thoughts on what it means to be successful. Is it “everyone knowing my name?” The satisfaction of realizing one’s ideas? The stage was darkened for “A Moment of Silence” by Allie Costa, based on the life and suicide of transgender teen Leelah Alcorn. In the play, a monologue from a transgender teen named Hailey—who, like Leelah, has committed suicide—is juxtaposed with lines from a press statement made by her mother after her death. In Saturday’s production, Osborne played an audio recording of the play read by the playwright, the audience’s focus directed to a handful of tea light candles flickering in front of flowers and a picture frame. At the beginning, Hailey described the way she always admired her mother’s style and grace, sharing memories that held a kernel of hope. These historical women are an inspiration, fighting to shout their true names, defining success on their own terms, and recognizing their pain instead of always playing nice. Osborne said that’s a big part of why she participates in 365 Women a Year and produces HERstory.